A major fashion and lifestyle channel has partnered with the leaders of the online gaming industry. As a result, a new casino has been born. The FashionTV Casino is promoting a well-known brand and providing a wide selection of online casino games. The promotions section show the casino team's eagerness to reward players with exclusive deals on a regular basis. Some of the deals are directly related to a fashion theme. The casino is able to appeal to casino players who have a certain passion for fashion products and desire to play in a venue that fuels their interests. The welcome bonus deal can be treated as a test case for whether the casino is willing to stay competitive in an increasingly crowded world of online casinos. In this case, the casino has decided to offer a really good deal! The €/£/$ 1100 welcome package is more than enough for the average player. There is a 100% first deposit bonus. It is provided in exchange for the player's first deposit up to €/£/$ 400 using the bonus code FIRST400. Next in line, a 50% bonus up to €/£/$ 300 is offered on the visitor's second deposit with the coupon code: SEC300. A 25% deposit bonus is given on the player's third attempt at depositing real money with the max deposit being 200 €/£/$. Use the voucher code: THIRD200 for this one. Lastly, the fourth deposit bonus is also 25% with a €/£/$ 200 max - bonus code: FOURTH200. The package deal is only available to first-time users. The weekday deals are another good reason to watch the casino! The player can take advantage of the special Tuesday Fashion Party offer. An extra 25% is offered on the deposits up to €/£/$ 100. If a player decides to make a deposit of €/£/$ 400, the play money would increase to €/£/$ 500. Another good deal occurs on Fridays. It's a cash-back-type deal. The player can get 10% back on the deposits made to the casino. Furthermore, the free spin offer is now available on the weekends. The website has a distinct advantage in that its services are available in multiple languages including; English, Chinese, Russian, Spanish, German, Swedish and Portuguese. In other words, it is a global casino which is open to working with people that represent many nationalities. The residents of the United States are not permitted to set-up an account at BetFTV Casino. The casino has shown which games have most often been selected by the players. 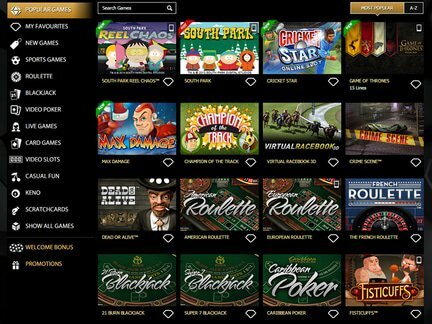 These titles have been highlighted and include the following; Spinata Grande, Tornado Farm Escape, Cosmic Fortune, Steam Tower, Game of Thrones, Lucky Leprechaun, Mega Moolah, South Park Reel Chaos, Starburst, Gonzos Quest, Aliens, European Roulette, South Park, Live Blackjack, MP Live Roulette, Multi-Wheel Roulette, Blackjack Reddeal, Go Bananas, Galacticons, The Dark Night Rises, Wonky Wabbits, Avalon II, Penguin Splash, Temple Quest, Boom Brothers, Twin Spin, etc. A mobile casino is also available to players who would like to try put the games on supported mobile devices. The new casino has not been given any red flags by the players. Apparently, it can handle their requests in a manner that does not call for intervention. This is an encouraging sign for a new venue. Hopefully, it will be able to sustain the criticism-free interaction with the players. The FashionTV Casino has the potential to grow and eventually reach the top of online casino charts. The cool fashion theme along with the recognized brand can be very attractive to the potential player. The customer support service can be contacted by e-mail and telephone. A small chat window pop-ups as well. A global license is held by FTVGG. It allows the casino to utilize the well-known FashionTV brand and benefit from the association. The casino is licensed and authorized by the Government of Curacao. I was deeply impressed by the highly interactive and content-rich online casino website. The main page graphics at FashionTV Casino are inviting and appealing. The fashion theme is also unique and will likely be recognized immediately by a niche audience as well as players who are simply looking for a totally new casino experience. I was also happy with the wide game selection and the presence of my favorite games at the venue. The slots game category is absolutely huge. I was able to choose between various types of slots including 3D slots games! The whole experience has been very positive. Hopefully, the casino will gain the trust of other players. It's always good to see a well-known brand associated with a casino. This gives it a certain level of legitimacy.